I didn't share this initially, but the Killer Next Door series is about my own life experience living next door to a convicted serial killer. The story h When I began my journey of becoming an author, I had no idea all the blessings that would be bestowed upon me. First, I have had the pleasure of meeting so many readers at signings and they have overwhelmed my heart with how much they love my books. Their words of affirmation have given me pure joy and they are the reason I write. To stare my stories with them is to give them a glimpse into my heart. I've also been tremendously blessed with bloggers who have tirelessly shared my stories, made teasers for me, promoted me, and just downright made me feel so welcome in the Facebook community. Carlie Sexton voted for Wild Reckless (Harper Boys, #1) as Best Young Adult Fiction in the Final Round of the 2015 Goodreads Choice Awards. This book was good!! I loved how Trace and Lindy had such chemistry. They way they bonded when they were both going through such difficult times. We’d love your help. 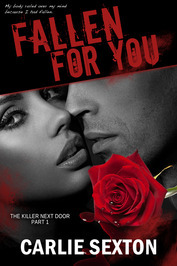 Let us know what’s wrong with this preview of Fallen for You by Carlie Sexton.